Here’s the second of two episodes of an obscure special series syndicated by London Records as part of the celebrations surrounding the coronation of Queen Elizabeth II. In program 2, reporter Josephine Hunter interviews Lord Donegal and James Farley at the lower level of the Rockefeller Center about the State Coach that will be used by the Queen to ride to and from the Coronation. London Records paid for a replica of the Coach to be transported to Rockefeller Center for a Coronation Week display. Farley briefly talks about his travels to Europe and Israel as part of work on the board of the Coca-Cola Corporation. Music from London FFRR Records is interspersed through the interviews. Goldin dates the program to June 2, 1952. The show was transferred from a sixteen vinyl transcription pressed by RCA, matrix number E3-KM-3553. 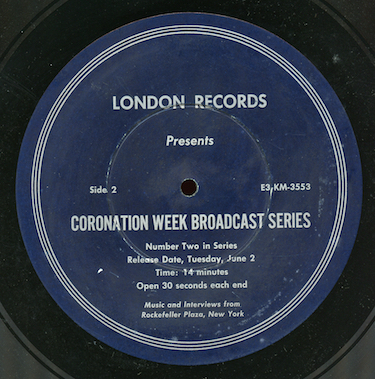 This week, we offer the first of two episodes of the obscure special radio series “Coronation Week”, produced by London Records, and syndicated to stations as part of the celebrations around the coronation of Queen Elizabeth II. In Program 1 in this special series, reporter Josephine Hunter interviews Lord Donegal about the special carriage that the Queen will use to ride to and from the Coronation ceremony, a replica of the State Coach is being exhibited in lower level of Rockefeller Center and London Records paid for transporting the replica for the exhibit. Interspersed with the interview with Lord Donegal, we hear excerpts of London FFRR recordings that can help you get in the spirt of the Coronation. Goldin dates the program to June 1, 1952. 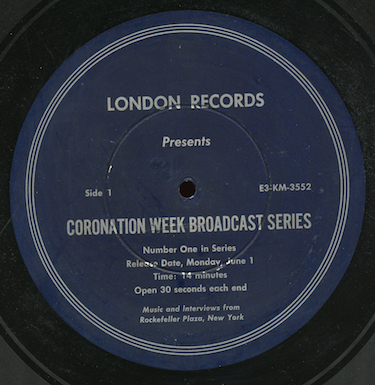 Although this is a show produced by London Records, it appears the discs were pressed by RCA. I suppose London didn’t have a pressing facility capable of producing 16” transcriptions in the US market at the time. Our mp3 has been transferred from an original vinyl transcription, matrix number E3-KM-3552. We’ll have one more show in the series from the other side of the disc next week. Curtis H. Springer was a unique American character. The self-described "last of the old-time medicine men", Springer got his start working with Billy Sunday's evangelical outfit and, in the 1930s, toured around the country and gave lectures, presenting himself as a member of the "National Academy", the "Springer School of Humanism", the American College of Doctors and Surgeons and other organizations, asking for donations. Working out of Chicago, Springer appeared on radio hawking various patent medicines. He applied for airtime on WGN and the station contacted the American Medical Association to check out his credentials. The AMA was appalled and produced a journal article on Springer, calling him the "King of Quacks". In this post, we hear Program 1 of a series Springer appeared in hawking Acidine, "Nature's Normalizer for Acid Stomachs", for United Remedies. It's one of five discs of the series I picked up in an auction a few months ago. In the shows, Springer takes questions from listeners that mix a homespun philosophies about religion and healthful living with colorful stories about his own life and the people he's met in his travels. In the first program of the series, Springer advises a listener about mortgaging their house to pay for their son's college education. Springer, of course, comes down on the side of experience and drive, rather than a college education, to get ahead in life. The commercial announcer is identified in program 4 as Hal Dean. I've found a couple of listings for what I think is this program in "Radio Guide" and "Broadcasting" magazines from 1934, so that's the likely time frame they were originally heard. Springer would go on to found the Zzyzx health spa in the Mojave Desert of California in 1944, continuing his syndicated radio programs. In 1974, Federal authorities shut down Springer's operation, convicting him of squatting on Federal lands and making false claims about the health foods and remedies he sold. Our program was transferred from an original single-sided translucent blue celluloid Brunswick transcription, matrix number 9149. The disc was pressed by Flexo, which was producing various promotion and radio-related plastic and celluloid discs. Unfortunately, the transcription, like many Flexo pressings has distorted over time, so it was a little difficult to play - you'll hear some noise and "swoosh" sounds from the aging plastic surface. The show was previously lost and uncirculated. I'll post the other discs I found from the series later - from what I can tell, these are the only surviving broadcasts by the "King of Quacks". It's been awhile since we heard our quirky musical variety series, "Here's to Romance". Program 55 of the series as it was heard on AFRS was originally broadcast on CBS on June 21, 1945. The first song on the show is "June is Bustin' Out All Over". Robert Ripley tells his "Believe It or Not" story about the discovery of penicillin - there's even an appearance by Sir Alexander Fleming himself. The show features Larry Douglas, Ray Bloch and His Orchestra, guest Marian Hutton and host Jim Ameche. This previously uncirculated show was dubbed direct from the original AFRS vinyl transcription; the date of the program is from the disc matrix. Here's a little audition program I haven't found documented anywhere. Wilfred J. Funk, of Funk and Wagnall's fame, published a popular book with this title in 1937. The concept was to explore new trends and fads and show that they're weren't really new at all. The current fad of painting your nails? Nudism? Been there, done that. The audition gives an overview of the series with some quirky and interesting facts and a brief sketch about an ancient Egyptian inventor who came up with unbreakable glass. The series itself would focus on one story or theme. 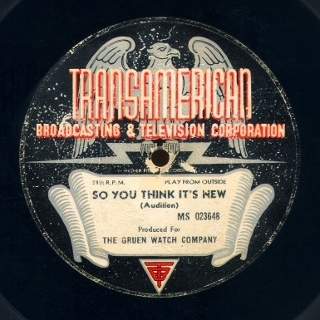 The recording includes ads for a Dallas jewelry store, likely to demonstrate how local continuity would work for the ads by the sposor, Gruen watches. The show dates from 1938, which Funk mentions during the program. It was transferred from an original one-sided Transamerican Broadcasting and Television Victrolac transcription pressed by RCA, matrix number 023648-1A. My thanks to listener Michael Utz for providing some funding towards the auction where I won this one. Anyone ever see any other episodes of the series? Did it survive beyond an audition? Now, we present one of the most unique broadcasts of the old time radio era. "We Hold These Truths" was a one hour dramatic program written by Norman Corwin for the 150th anniversary of the Bill of Rights. Scheduled to be heard on all four networks on December 15, 1941, events would turn the program into something bigger than a simple commemoration. The federal government commissioned the broadcast and preparations were made for the show before Pearl Harbor, of course. 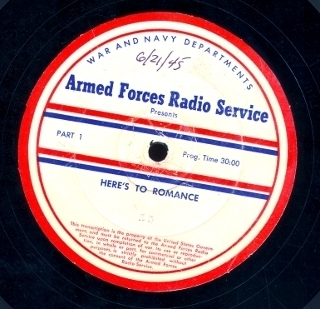 With the nation suddenly at war, the program took on a special meaning - it holds the record for the largest radio audience for a dramatic program. Some have estimated that 63 million listeners, about half of the US population at the time, turned in to the program. Heard in the show, broadcast from Hollywood, New York and Washington, DC, are Lionel Barrymore, Jimmy Stewart, Orson Welles, Edward Arnold, Walter Brennan, Bob Burns, Walter Huston Marjorie Main, Edward G. Robinson, and Rudy Vallee. The music was composed and conducted by Bernard Herrman; Leopold Stokowski conducts the national anthem at the end of the program after remarks by President Roosevelt. This mp3 of the program was transferred from an original Federal Radio Education Committee, US Office of Education, vinyl transcription set, matrix numbers G-3013-P, G-3014-P, G-3015-P, G-3016-P. I think it's one of Orson Welles most memorable radio performances, by the way - he practically chews up and spits out the microphone during the show. Note: The attached pdf file contains racial stereotyping themes that may be offensive to some blog readers. "Lone Wolf Tribe" was a juvenile series that ran on CBS for one or two seasons, circa 1932-33, three days a week. The show followed the adventures of Wolf Paw and his Indian tribe. I haven't found out much about the program, except for a page on a collectors site that talks about premiums offered in conjunction with the program. In this post, "The Tribe Book of the Lone Wolf", a pdf file of a booklet offered to listeners of the show. It includes secret signs and picture writing you should only share with the members of your tribe, some info on Native American lore (at least the way that Madison Avenue imagined it), the Wolf Tribe credo, and, most importantly, a catalog of fine "Indian things" you can get by trading "wampum" (ie, Wrigley's Chewing Gum wrappers). Unfortunately, there doesn't appear to be any surviving episodes of the series. Anyone have additional info to offer about it? The pdf file, linked on the ebook icon below the post, is about 1.8 MB and runs 28 pages. Finally this week in our look at the end of World War II, we hear a remarkable broadcast - a special episode of "Command Performance" dubbed "Victory Extra", prepared for VJ Day and broadcast August 15, 1945 on the Armed Forces Radio Network. Running a full 100 minutes, the show features an incredible array of actors, actresses, comedians, performers and personalities - almost anyone who was anybody showed up to celebrate the end of the War for our troops. Below, after the jump, is a complete outline of all the program contents for the purposes of indexing and searching for the show, but, if you've never heard it, I'd recommend you just listen and be surprised at who shows up. 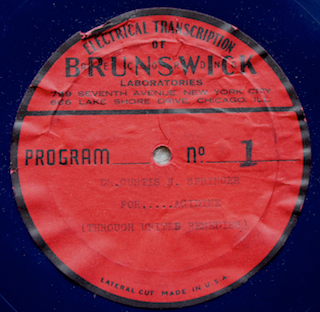 The program was transferred from an original AFRS vinyl transcription set. Click "more" to see a complete listing of the show's performers. Dinah Shore singing "I'll Walk Alone"
Ginny Sims singing "You'd Be So Nice to Come Home To"
Frank Sinatra and Bing Crosby engaging in banter and singing a few song excerpts, then Frank sings "The House I Live In"
Janet Blair singing "What Is This Thing Called Love?" William Powell introducing Bing Crosby singing "San Fernando Valley"
The King Sisters singing "Shoo Shoo Baby"
Lena Horne singing "The Man I Love"
GI Jill introducing Johnny Mercer singing "GI Jive"
Marilyn Maxwell singing "I Got Rhythm"
Carmen Miranda singing "Tico, Tico"
Claudette Colbert with Ed Gardner as "Archie" from "Duffy's Tavern"
Greer Garson introducing Bing Crosby singing "White Christmas"
Of course, a more serious issue after the War were the struggles faced by disabled vets after they came home. In this post, we listen to a drama syndicated by the Disabled American Veterans titled "Riot Squad". The show features Henry Fonda in the true story of Dave Snyder who lost his legs in the War, but went on to become a member of the "riot squad", a social club for disabled vets. Goldin lists a series titled "Disabled American Vets Make Good", but the series title isn't identified on the label for this program, so I'm not sure if it's from the same series. (Goldin lists the program on its own under the "Riot Squad" title.) The show was transferred from an original WOR vinyl transcription, matrix number 12885A. Continuing our examination of the end of World War II, we turn to "Home Is What You Make It", a sustained NBC public service series focused on issues related to the War and the home front. Only a couple of examples of the show are listed at Goldin. In this post, we'll hear the first half of the episode of April 20, 1946, "Promised and On the Way", the 74th program in the series. Ben Grauer hosts a dramatized tour through the amazing new conveniences on the way for American home makers in the post-War period. The show was transferred from an original line check lacquer from John Keating Studios, Portland, Oregon, probably at KGW, and includes the NBC opening system cue. The program was previously lost and the second half, unfortunately, doesn't survive.